Join one of our weekly group classes. Book online in advance, or call, or email for more information. Held 9am and 11am daily. Group lesson with experienced coach on the water. Learn the basics, improve your skills, get active. Suited to all experience levels – never too young or old! Take a long and stunning tour of Noosa River with one of our guides. Learn the basics, improve your skills, get active and refine your technique while exploring the pristine waterways of Noosaville. Suited to all experience levels, our guides can plan your tour depending on your confidence, and will also share some secret spots! the water in this challenging and fun fitness SUP class. Suitable for all fitness and experience levels, this class will help you lose weight, strengthen your core, and have fun with others on the river. 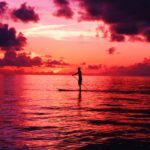 Add an extra challenge and beauty to your yoga session with SUP Yoga. Led by experienced teachers Sarah Rose, or Kat Harding, this class is suitable for all fitness and experience levels, this class is about having fun on the water, trying something new, and stretching out your body. Bookings are recommended for this class as numbers are limited. 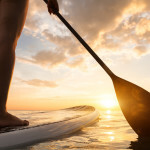 Stand-Up Paddle lessons are a great way to have fun with friends or family and enjoy quality time out from your busy life. They are also a great idea for your next corporate group event or social group activity. For your very first lesson we will take you to the calm waters of Noosa Sound as it is a safe and protected place to learn and a great way to build your confidence before advancing to the ocean. The point isn’t to become the next SUP-ing champion, but to have fun! However, be warned as once you try it, you will be hooked! Lessons include: equipment hire of board and paddle, instruction and safety advice, paddle strokes and turns, control board direction and much more. What to bring : yourself 🙂 plus water, sunscreen towel etc. We supply a Noosa Stand Up Paddle rashie for you to wear during your SUP session.